Railpool leasing was the launching customer of the Traxx AC3 locomotive platform, which was first presented in May 2011. Initially, Railpool ordered five AC3 units with additional Last-Mile Diesel feature. This order was part of a framework agreement for the delivery of 36 Traxx locomotives signed in December 2010. Over time, the number of 187s in the fleet of Railpool grew to 30 locomotives. Locomotive 187 004 was the first Traxx AC3 locomotive in Railpool colors. it left the Bombardier factory in Kassel in November 2013. As seen on 27.11.2016 by Mario Lippert and Andreas Pusch. Marcus Alf was at Kassel-Oberzwehren today to catch two new locomotives on maiden run. The Westfälische Landes-Eisenbahn (WLE) is now operating unit no. 187 307. The brand new machine is hired from Railpool as a replacement locomotive for WLE's own TRAXX AC3 no.82, which was recalled by Bombardier for an update. Christian Klotz made pictures of both machines this week. Busy times in Kassel. Again three new machines completed their maiden run on 28. and 29.09.2016. Two silver painted machines for Railpool: 187 310 and 311. Also NS E 186 040 made its obligatory round. Thanks Christian Klotz. Two TRAXX AC3 machines on maiden run today, for two different customers: Railpool's 187 309 and DB Regio 147 005. Thanks Christian. On 24.09.2016, Railpool's future 187 316 was seen in Berlin-Schönefeld and photographed by Dr. Günther Barths. This locomotive belongs to batch 187 300-316, planned for services in Germany, Austria, Hungary and Romania. Five such machines were ordered by Railpool in November 2015. Since 18.05.2016, the new Railpool 187 301-7 and 187 302-5 are hauling trains for Lokomotion. Both machines are used only in Austria, as they are not officially approved for the other countries they are built for (Germany, Hungary and Romania). The delivery of Railpool 187 300-316 is a very slow process. 14 months ago we could already see the first units under construction in Kassel, still no machines are being seen in revenue service. However things seem to be moving (literally) with 187 301 showing up today in Austria, under the responsibility of WLB. We have also seen 187 302 in Linz recently, and 187 304 left Kassel in the third week of April and was then seen in Passau and Gramatneusiedl. Today, the new Railpool 187 304-1 was seen in Passau (DE). It is on its way to Austria. The locomotive is equipped for services in Germany, Austria, Hungary and Romania. it is the first of a new batch of 17 TRAXX AC3 locomotives for Railpool, to be numbered 187 300-316. Bombardier Transportation announced today that its Bombardier TRAXX AC3 Last Mile Locomotive has been homologated in Austria. This means the TRAXX AC Last Mile locomotive is now approved for operation in the entire DACH region: Germany, Austria and Switzerland. Our first image of Railpool>BLS Cargo 187 008 with DVA Flex Panel, featured in this marvellous scene. The machine mentioned pilotes train TEC 43003 and Railpool 186 108 in the Wattinger curve near Wassen. Thank you Georg Trüb. Railpool 187 004 in Leipzig, 19.11.2015. The locomotive was in the area for ETCS tests. As long as Railpool 186 181 is out of service for its R1 overhaul, 186 424 will be pulling Benelux trains from Amsterdam to Brussels and back. The image shows the locomotive and such a train at Zevenbergen on 13.11.2015. (Henk de Jager). Railpool Traxx AC3 no. 187 300: first of a series of AC3's to be used in Germany, Austria, Hungary and Romania. 17 units are planned. DB 245 021, first of a batch of seven machines ordered by the German railways for pulling DB (Autozug) Sylt shuttle services. Until now, we only know of Traxx AC3 electrics (on order) to be homologated for Germany, Austria, Switzerland, Hungary and Romania. Bulgary is new. This video shows Railpool 187 004 in Curtici Romania in diesel mode. 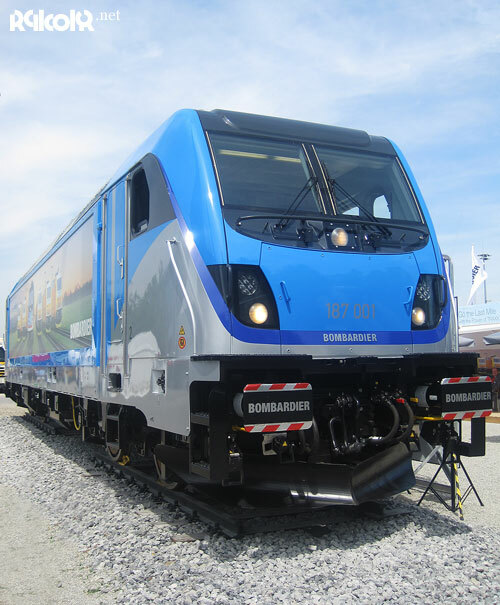 Soon, Bombardier will start delivery of a new batch of Traxx Ac3 locomotives to Railpool: 187 300-316. It is planned to have (some of these machines) approved for Romania too. On 21.04.2015, Railpool's 187 005 came back from its trial adventure in Norway. Press 293 046-7 took it back to Kassel, to the Bombardier factory. The same day, Railpool 187 007 made a test run from Kassel to Hannover and back. nrk.no brings a report including a video of Railpool 187 005-4 shunting in Trondheim. You see the machine pulling a freight train in diesel mode. The Bombardier Traxx AC3 locomotive with Last Mile module (Railpool no. 187 005) has passed another endurance test over the weekend. The locomotive ran over the Bergensbanen, an high altitude route in Norway with corresponding geographical and climatic challenges. This line connects Bergen with Oslo and has track gradients of up to 25 per thousand. The locomotive successfully pulled a 465-meter-long freight train for operator Cargolink. On a slope (its gradient was 21 per thousand) the test train was stopped in order to verify its performance in diesel mode (lowered pantographs). Despite wet rails the locomotive successfully moved its train from standstill. Generally, the tests proved the locomotive has a significantly better track record regarding adhesion in comparison to existing vehicles. The improved adhesion control is available in both electric and diesel mode. Furthermore, the locomotive successfully completed the shunting operation tests in Bergen, where the machine had to take parts of the train, loaded with electric cars, to Minde. It pulled its train over a gradient of 20 per thousand in the last mile mode to the local storage place for cars. Yet again, the Bombardier Traxx AC3 locomotive with Last Mile module has completed a challenging task under real conditions. During the past days, Railpool locomotive no. 187 005 has been tested by operator CargoLink. For this purpose the locomotive was transported from Germany to Norway. On 01.03.2015, the 005 pulled a 1000t freight train in Last Mile (diesel) mode over a track section with a 1,7‰ gradient. This was done at the Oslo-Alnabru freight station. During the next days, the locomotive completed various shunting operations at the same location. CargoLink and Bombardier tested the performances of the Last Mile module under real conditions in the Scandinavian country, in order to decide if this type of machine is fit for hauling CargoLink's freigth trains on non-electrified track sections in Bergen and Trondheim. In general, these trains have a gross weight of 800-1000t. A milestone for the Bombardier Traxx AC3 Last Mile locomotive: The electric locomotive has received official authorization for unrestricted commercial operation in Switzerland. 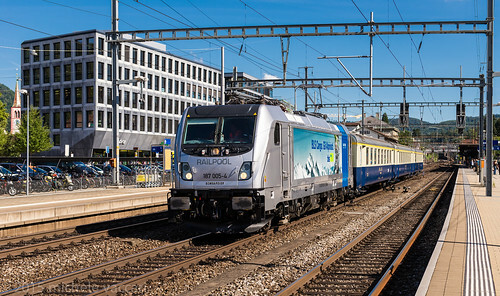 The authorization was granted after extensive testing of the eight locomotives ordered by Railpool, three of which were deployed in Switzerland by BLS. Four more will be delivered to Akiem, and an additional Traxx AC3 locomotive with the innovative Last Mile feature was handed over last week to the Swiss company Swiss Rail Traffic (SRT). The locomotive's Last Mile feature, a combination of auxiliary diesel engine and battery, will help SRT bridge a five-kilometre non-electrified line section. Three Traxx AC3 locomotive with Last Mile shunting module have entered the railway network of Austria today. The DB red ran on its own power to the Alp country, pulling the Railpool liveried 187 005 and 007. Remarkable, because (as far as we know) the Traxx AC3 has no final approval for any country yet, although several machines sport DE/AT/CH markings and AC3s are already being used by BLS Cargo In Switzerland. Check this nice picture of the 187 004/008 and their train in Wassen. Meanwhile, 187 004, 005 and 007 are on their way to the Czech Republic (destination VUZ Velim test center). RailAdventure picked up the 004 in Ingolstadt and the 005 and 007 came from Kassel. On 29.05.2014, Railadventure picked up to Traxx Last Mile locomotives in Kassel: 187 003 and 187 006. Read the complete press statement (DE) here. A milestone for Bombardier and BLS Cargo. On 05.03.2014, the Swiss freight operator completed the delivery of an articulated trainset to the freight terminal in Visp. This was done on a track section without catenary. No problem for the Traxx locomotive with additional diesel engine and battery. BLS Cargo will transport seven new trainsets from Bussnang to Visp. Locomotive 187 002 was used to deliver the first transport. With the locomotive BLS Cargo no longer has to rely on a local shunting company, just to move the train over the last couple of kilometers. This results in a more efficient process for BLS Cargo. For the first time since its introduction in 2011, we can see a new Traxx AC3 locomotive in the corporate colors of the first customer: Railpool. The lease company has five such locomotives, with additional Last Mile diesel engine, on order. Railpool 187 004 is the first to be out-shopped. Railpool has decided to strictly apply its standard livery to the locomotive; A silver base livery and the blue banner on every side. Very smart is the application of the big Railpool logos on the ribbed side walls. It will always be visible when no Flex Panel is used. Customers of Railpool to use such a Panel, to be spanned over the ribs, to apply their own identity to the locomotive. Click the image to go to the new Traxx AC3 section. Last week, Bombardier presented the latest member of the Traxx family, the successor of the Traxx AC2 (aka Baureihe 185.2). We were invited to take a close look and ask questions. The section contains everything we got to know. Have fun! (Hope you don't mind we wrote in the past tense..prevents the text from getting too outdated too quickly).